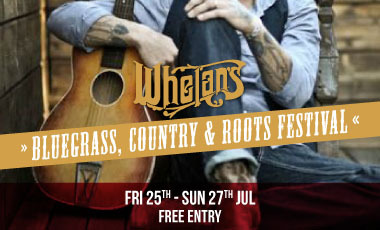 Whelan’s, one of Dublin’s most iconic music venues, is hosting the Bluegrass Country & Roots Festival on July 25th, 26th and 27th July showcasing the best up and coming talent emerging from Ireland! Featuring four fantastic bands, with a mixture of roots, trad and rock, the show will run from 8pm to 11pm giving you the chance to experience the real taste of an Irish pub session with a country twist! The best part? This festival is completely free! 2014 marks 25 years for Whelan’s – Ireland’s most famous live music venue. So far The Frames, Damien Rice, Hozier, Something Happens, Sharon Shannon and God Is An Astronaut have played very special nights in the venue – who will you see there next?